In Kermit Hall’s words, the nineteenth century saw the “triumph of contract” over property, tort, and equity, as the law came “to ratify those forms of inequality that the market system produces.” (196-97) The early twentieth century continued this — at least until the Great Depression and Franklin Roosevelt’s New Deal forced the court to reconsider. As I discussed earlier, Allgeyer v. Lousiana, 165 U.S. 578 (1897) expressed the unanimous opinion of the Supreme Court that freedom of contract was a fundamental right protected by the due process clause of the Fourteenth Amendment. While this case itself was applied to limitations of out-of-state businesses operating in Louisiana, its valorization of the “liberty of contract” was extended to employment regulations as well (Hall 398). the proprietors of these establishments and their operatives do not stand upon an equality, and … their interests are, to a certain extent, conflicting. 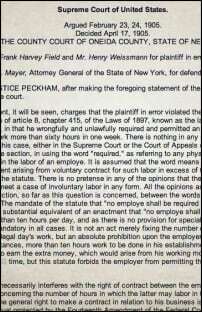 … In other words, the proprietors lay down the rules and the laborers are practically constrained to obey them. As regulations limiting children’s working hours in factories are a valid exercise of a state’s police power — which also includes enforced vaccination, quarantine, and other protections of the public’s general welfare — so too is an act that seeks to protect workers in a particularly dangerous occupation (mining). the general right to make a contract in relation to his business is part of the liberty of the individual protected by the Fourteenth Amendment of the Federal Constitution. 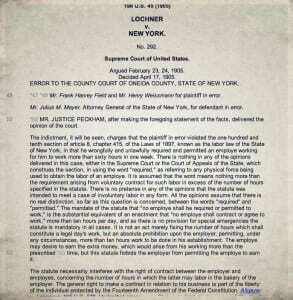 The Lochner Court construed the law as an absolute interference “with the right of contract between the employer and employees,” then declared that “the general right to make a contract in relation to his business is part of the liberty of the individual protected by the Fourteenth Amendment of the Federal Constitution.” The Fourteenth Amendment’s Due Process Clause–originally intended to overturn Dred Scott and to prohibit so-called “Black Codes” — prohibits states from depriving any person of life, liberty, or property without due process of law. To the Lochner Court, the right to buy and sell labor through contract was a “liberty of the individual,” and was thus constitutionally protected. Lochner was finally challenged successfully during the Depression, in West Coast Hotel Co. v. Parrish, 300 U.S. 379 (1937), which finally allowed for a general minimum wage in Washington State–and thus overturned the maximalist version of freedom of contract.